I'll be the first to admit that I'm not a huge fan of cruise ship entertainment. I'm not even sure I've ever sat through an entire performance onboard. Don't get me wrong, I love cruising, I've just always found the shows a bit, 'cheesy', like a bad Abba tribute act at a social club, (although that's just my opinion, I know loads of people who love the shows). With that in mind you can imagine I was quite sceptical when a piece of news crossed my desk this morning stating that Silversea cruises had partnered with a company called Choozi Entertainment to completely revamp their onboard shows. In a move away from traditional production shows, the new concert-style concept will feature an outstanding cast of classically trained vocalists and musicians performing a lively celebration of music from Motown and opera to pop and rock. The star-studded cast and production team are headed by visionary director and choreographer Christopher Childers and his sister, Suzanne Childers. I think what surprised me so much about this news wasn't the fact that Silversea were doing it, after all, all cruise lines change their entertainment from time to time, it was more the company they had chosen to do it with. I had a look at the website for Choozi entertainment, (you can see it by clicking here), and couldn't imagine a company further from the ultra luxury Silversea but that being said I think they look really fun and could actually imagine myself sitting through most of this companies performances, (most). They will be putting on different performances around the ship in different venues to let guests sample a bit of everything that they offer. They will have a show called Signed, Sealed and Delivered that will represent a journey through the history of Motown. Another is to be called High Cs and will be a collection of well known arias from across the board, anything from Verdi to Puccini to the most popular songwriters of today. The one that has me most worried as I just can't see if fitting onto a Silverseas cruise is a cruise called Fabbalicious and yep, you've guessed it, it's an Abba tribute act or more correctly, (according to Silversea), a show that "faithfully recreates the original sound and iconic look or the 70s Swedish pop band". - So a tribute act then? Hmmm, not sure how this last one will go down with regular Silversea cruisers but wait, there's more! A show called Decades which will be a tongue in cheek look at the history of pop show casing anyone from Madonna to Lady Gaga in a party atmosphere by the pool. But as well as all this there will be ship specific acts ranging from Lennon and McCartney, Boubil and Schonberg, (no idea), songs from Miss Saigon Les Miserables and Billy Joel. It's a bold move from Silversea as I think there's a lot there that the more traditional luxury cruiser might not like but from someone who wouldn't normally enjoy a cruise ships entertainment I think it sounds amazing. 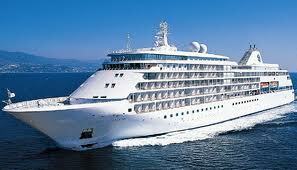 Have you cruised with Silversea before? How does this new program compare to what you experienced onboard? And to anyone that hasn't cruised with them before, would this make you more or less likely to book a cruise with Silversea?